Cholic cure found in probiotics? After only one week of supplementation the reduction in daily crying time was 74 % among the infants supplemented by L. reuteri Protectis compared to 38 % in the placebo group. At the end of the study there was a significant difference between the two groups. These results are in line with previous studies on colics and confirm the benefit of L. reuteri in colicky infants, says Doctor Francesco Savino, Department of Paediatrics, Regina Margherita Children’s Hospital, University of Turin, Italy. In this double blind, placebo controlled study 50 infants with confirmed infantile colic were randomly assigned to two treatments: L. reuteri Protectis drops 108 CFU per day or placebo for 21 consecutive days. 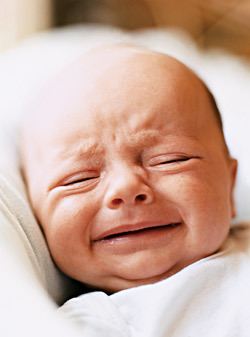 The primary outcome was a reduction in average crying time to less than three hours per day, which is the limit of colic, by day 21. On day 21, 84 of the L. reuteri Protectis supplemented infants had resolved their colic (dropped to less than three hours of crying), a significantly higher number compared to 43% in the placebo group (p<0.05). At the time of inclusion the median crying time per day was 370 minutes in the probiotic group and 300 minutes in the placebo group. On day seven the crying time had been reduced by 74 %, to 95 minutes, in the L. reuteri Protectis group and to 185 minutes in the placebo group (p=0.082). At the end of the study there was a significant difference in median daily crying time between the groups, 35 minutes in the L. reuteri Protectis group versus 9 minutes in the placebo group (p<0.05). The proportion of infants responding to the supplementation, defined as a 50 % or greater reduction in median crying time, was significantly greater in the L. reuteri Protectis group compared to the placebo group at day 7, 14 and 21 of the study. The data with L. reuteri are convincing and confirm, in a placebo-controlled study, our earlier data with this probiotic. We believe these results will have an impact on the treatment of infants with colic, says Doctor Savino. The study was presented on the Annual Meeting of ESPGHAN in Istanbul on the 10th of June 2010. Previous post: Resveratrol’s heart health benefits pinpointed?